This coming Sunday is Mother’s Day. And, it is a time to be grateful for all that your mother has done for you. Make sure that you not only let her know how much you appreciate everything she’s done for you, but also show it by showering her with love. Trinity, Xander, and I are going to bring my soul mate and their mother a special breakfast in bed. The kids are soooo excited, and already planning all kinds of fun stuff. This is a great opportunity for daddy to bond and have fun with the kids as well. Today I wanted to take a different approach and hit on a special group of moms. I’d like to dedicate this post to hemophiliac moms. All mothers have a very tough job and they determine the outcome of a child’s beliefs and character. I consider this job one of the most important in the world (and toughest!) That said, there is another breed of moms that take it to a whole new level. Mothers who have children with disabilities are on on a whole new plane. These moms not only have everyday normal things to deal with, but they also do regular trips to the doctors, specialists, hospitals, counselors, and treatment centers (among other places). They do everything that all mothers do, plus have a plate of troubling times that most of us would run screaming from. These moms are a special breed. And, today’s special breed is close to my heart, because my mom is one of them. And, my wife is one of them. I can never properly convey the amount of gratitude and appreciation that I have for these AMAZING women! If you are the mother of a child (or children) with a bleeding disorder than I salute you. You, my friend, are a rare individual who is doing more for the planet and human race than I can fathom. Thirty years ago, the hemophilia population started dying off… I’m talking about 90% or more getting HIV from tainted blood products… Nearly 100% getting hepatitis C… This was beyond devastating to the community as a whole. Think about it for a moment… Almost the entire hemophilia population died over the twenty years that happened immediately after this disastrous event. As a matter-of-fact, all of my hemophiliac friends that I knew died. ALL OF THEM! If you consider this for a moment, you will realize the depth of this tragedy. You might also realize the moms out there who lost their babies… Lost them by the thousands!!! I am crying simply typing this… Imagine (for a moment) their pain. These women have been through more than anyone deserves to endure. They have done so, and continue to do so. They are heroes. The real-deal hero! Another point that comes to mind when I think about moms and what is known as the Hemocaust… Many of the community-run organizations were mostly managed and maintained by adult hemophiliac men. Almost all of these men died. Think on that. Literally, in a short period, we not only lost our brothers and sisters… We also almost lost the entire community, because no one was there to run the organizations. This is nearly unimaginable to me, yet it was happening around the country. I often think of euphemisms for this occurrence. The one that really comes to mind is passing the torch. Well, I was talking about this with my buddy, Jack, the other day and it hit me… This was not simply passing the torch. It happened too fast and too devastatingly to let anyone pass anything. In an instant people started dropping like flies. No… What really happened was this. Thousands of men died. Thousands of men literally DROPPED their torches without the time or energy to pass them on. During that time, the community and future generations needed someone to act. Someone did act. The moms acted. The moms stepped up, despite their pain and anguish. Selflessly, they wiped away their tears and they picked up the torches from the ground. In some case the torches had gone completely out and needed to be re-lit. Regardless, a generation of moms… A generation of women stronger than most can imagine… A generation of loving and kind souls… Came together and rebuilt a community that nearly died. I can tell you that I fell away from the community more than a quarter of a century ago. Heck, I assumed I was dying. But, to my amazement, when I came back four years ago, I found a thriving community… A community of strong people who were dedicated and focused. A community that had fixed itself with band-aids and duct tape through the nineties and into 2000. A community that was not only still standing, but standing tall, strong, and proud. Damn! I mean… Damn! I am in awe of what transpired. And, I am eternally grateful to all of the people who came together to save us. Most of all, I am grateful to the moms. Have a very special Mother’s Day, moms!!! I was born in 1967 with a rare bleeding disorder called, hemophilia. All through elementary school I was bullied because of my weakness and difference. Also in junior high, where the bullying became more dangerous. Fortunately, the varsity football team took me under their wing and protected me in high school… For the first time, I was not bullied. I thought the bullying was over… Then, in the mid eighties I received a bad batch of blood to cure a bleed. This blood product, called Factor VIII, was tainted with HIV and I was the lucky recipient. Little did I know that the bullying was about to go to a whole new level. Besides the whispering of people whom I called friend, the biggest first thing that happened to me was being asked in front of my entire community at our neighborhood swimming pool, “Do you have AIDS?” I lied and ran crying from this situation. Next, the death threats started coming in via anonymous telephone calls (back then there was no caller ID). Someone also threatened to burn our house down if we did not move out. This was a scary time for everyone and the stigma was in full swing. I quickly realized that a safer bet was to hide my HIV status and act as if there was nothing wrong. Well, this was tough because it was becoming more known that most hemophiliacs had it. So, I also hid my hemophilia. Within a few, short years, all of my hemophiliac friends were dead. I was literally the last man standing and completely quiet about my affliction. 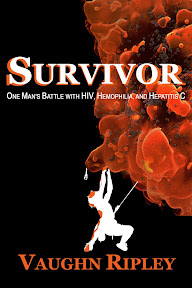 Twenty-three years later, I compiled my life journal into a book and published my memoir, Survivor: One Man’s Battle with HIV, Hemophilia, and Hepatitis C. This was my “coming out” party. I mean, it was impossible to hide my status with a published book out there… I felt relief overcome me as I admitted to the world that I was a long-term survivor and thriver. People came out of the woodwork with questions and stories. I was thrown into the limelight and overnight became an inspiration to thousands of hemophiliacs who had dealt with this situation in their own lives. There was a down side… The stigma surrounding HIV was lessened, but still in operation. So, I have managed to duck and dodge my way through a few of those situations that brought back horrific memories of the old days. Mostly though, it was all up-side and inspirational things that happened to me. Out of the blue, an amazing man, Barry Haarde, approached me as another HIV+ hemophiliac who was also coming out about his status. He was quickly becoming a special man in our easy bleeding community. Barry talked to me, and inspired (more like motivated) me to get back into the bleeding disorder community and not only tell my story, but help raise awareness and battle for other hemophiliacs. I did. What does all of this have to do with poppy plants? You ask… hmmm… Well, I wanted to give you a little back-story of where I’ve been before discussing today’s article. The Australians have a saying… It’s called tall poppy syndrome. See, if a particular poppy grows taller than the others, it will steal the sun and water from a bunch of other, smaller, poppies. So, they chop the tall one down in a sacrifice to save many others. When this saying translates to people, it has a less positive outlook, and means when some people see you attaining success and growing before their very eyes, they chop you down to keep you down among them. You can see this derogatory version is a little bit disheartening. Today’s post was inspired because I find myself trying to promote me, hemophilia, HIV, and fitness to raise awareness in this callous world. I am currently leading a competition (by a long shot) to appear on one of the most popular Men’s magazines in the world, Men’s Health. You can see my entry (and vote for me) here: www.mhguysearch.com/entry/37 (yes… that was a shameless promotion). Of course I want to be on the cover! I’m proud of what I’ve accomplished despite my “issues.” However, I’m not so shallow that this is only to get ME on the cover… I’m doing this for you too. I have found a purpose that is more important than just me. Supporting people with hemophilia, Von Willebrand, other bleeding disorders, and HIV+ or other life-threatening diseases. Also, for anyone who struggles with staying fit and healthy! I am the poster child for all of us!!! The rules of the competition state that people can vote once daily. I did not write these rules, but I understand the importance of them. Therefore, I posts a daily plea to my friends to request their vote. Can you imagine putting an HIV+ hemophiliac on the cover of a popular health magazine (for the first time ever)?? This is an incredible opportunity to raise a huge amount of awareness in an otherwise unknown community of bleeding disorders. With this in mind, over the last several days I have received a few messages talking about me spamming the community. Now I must mention that I am receiving thousands of like, votes, and messages saying how inspiring this is. And, hundreds of hemophiliac moms have reached out to me saying how important my message and story is to their children. The good outweighs the bad by the hundreds. However, the bad messages do stand out to me, and hurt my feelings. You see, I was asked by many, a few years ago, to please stand up and be heard. To help support the community by sharing my story. And, I answered this calling by doing so. Yet I now find myself occasionally battling people who seem to be trying to bring me down. I know these feelings might be my own internal battles, but I can’t help but wonder if some are merely picking on me and my advocacy simply because they are miserable and want to attack people who they see doing good things in this world. I’m certain that not everyone of these spam name callers feel this way, but I’m also aware of a few who literally are negative and sometimes downright mean. Let’s define Spam… Besides being a canned meat product, spam is also defined as a noun that means: Irrelevant or inappropriate messages sent on the Internet to a large number of recipients. While I am posting in an environment that has a large number of recipients, I feel that my appeal for awareness is extremely relevant and appropriate. Perhaps I’m nitpicking by defining spam and excluding my posts from it, but I’m making a point. If I’m reaching out to a community to raise awareness and help those who cannot help themselves… How can I possibly be spamming? It is not always easy to raise awareness, be an advocate, and speak out to the world about tough subjects… If it was easy, everyone would do it! No one is asking for your money (although I might if the event warrants it). I’m not asking you to do some crazy thing… I’m simply asking you to visit a website and make your voice heard, by voting for me. How do you think I got in first place (by more than double)? Do you think I would have this many (or any) votes if I didn’t post anything? Of course not! I’m an honorable man doing honorable things. I stand by a community that all but disappeared when they all died around me. I feel like a phoenix who has risen again and find a whole new generation of young bleeders and their families flocking to me for advice and inspiration. I will continue to tell my story to the ones who want to hear it. If you don’t appreciate my outlook on life, then simply don’t read my posts! We recently passed the thirty year mark of discovering AIDS. And, I have been living with it for more than twenty-eight years. It is high-time that we broke this stigma and show that you can be a HIV+ hemophiliac and still be healthy. I’m not only standing up for hemophiliacs. Nor only HIV+ people. I’m also standing up for average people in general. Statistics show that more than 65% of Americans are overweight. I fear this number is far higher than advertised. I am using myself as an example of someone who is suffering through much more than the average person and still manages to stay extremely fit and healthy. My message is simple: If I can do it, so can you! This applies to everyone!!! You all lift me up and make me feel like a loved person. You also inspire and motivate me to continue my work and voice… Thank you! Have you ever run in to “Tall Poppy Syndrome,” or know someone who has? Have any advice or thoughts on the matter? HaPpY BiRtHDaY to my darling angel, Trinity. She turns nine years old today! As many of you know, it is an unbelievable miracle that she’s even here with us. Today’s article is dedicated to her, and other miracle babies like her. I realize that this post is about Trinity, and not me… However, this is a very important fact. Being HIV+ has me facing many facts. Until medical science caught up, one of those facts was that I would never have a child. At least not without the possibility of transferring HIV to my wife and/or child. Hence, until about a dozen years ago, Kristine and I assumed we would not have children. That changed when a form of in vitro fertilization (IVF), called ICSI, was approved for serodiscordant couples (where one partner is HIV-positive and one partner is HIV-negative). You can read more about IVF here: healthywealthytribe.com/creating-life-in-a-laboratory. From before she was born, Trinity was a stubborn baby. Right around her due date, we found out that Trinity was sitting breech in the womb. The doctor made some simple attempts at turning her, but such a headstrong child was not moving for a mere doctor. Kristine was admitted for a cesarean section. During the C section, the doctors exclaimed that something was wrong with Kristine and she was losing too much blood. Her whole body went deathly white and they wrapped her in heated blankets to keep her warm. I’m certain that they covered up a serious problem by telling me that there were complications, but that she would be fine. Again, this doesn’t have a direct correlation with Trinity, but she might very well have lost her mother from day one! When Trinity was born, she didn’t cry immediately. And, her breathing sounded a tad raspy to me. I turned to the nurse and said, “Something is wrong.” The nurse disagreed and said everything was fine. Within minutes they were scurrying around looking flustered like a barn full of clucking hens. I knew something was serious, but didn’t know what. Asked to leave, I went to get something to eat from the cafeteria. In a matter of minutes, I thought we were close to losing Kristine, and now, something was wrong with Trinity. My head was swirling. Returning from eating a meal, I found Kristine crying. She explained to me that Trinity had esophageal atresia and needed an immediate surgery to live. Essentially, Trinity’s esophagus had not fully developed and it wasn’t connected to her stomach. To top it off, she would need to be transported to Children’s Hospital for this emergency. About 1 in 2,500 babies is born with some form of esophageal atresia. The scary (and another miracle) part is that all babies with this disorder born prior to the operation invention (approximately fifty years ago) died from starvation! Can you say, miracle? While couped-up at Children’s, the first communication that Trinity had was grabbing my finger. She reached out, grabbed it tightly, and peered into my eyes as if to say, Don’t worry Daddy, I’m strong and will be fine. I knew that she was special, and dare I say it… A miracle. Another situation occurred while Trinity was still in Children’s Hospital. She caught Methicillin-resistant Staphylococcus aureus (MRSA). MRSA is a staph infection and bacterium that’s responsible for several difficult-to-treat infections. It is especially dangerous in young children. Considering that approximately 10% of people with MRSA die from it, I would say that warrants another Miracle Baby check-mark. When Trinity was a wee-little-one she had oxygen related issues. Kristine brought her in to see the doctor and the doctor immediately called an ambulance. She was taken to the hospital on a few occasions to tackle this problem, and she spent a few nights in an oxygen tent. Even as a little baby, she was still dealing with life threatening illness and troubles. And, perhaps more importantly, she was surmounting these deadly issues as soon as they came. At a young age, Trinity was diagnosed with asthma. Nothing like some of the things she dealt with at birth, this is still a tough challenge and something she will deal with for her entire life. I’m confident that her headstrong attitude and downright stubbornness will get her by this speed bump without a hitch. Most women born to hemophiliac fathers do not get the disease. Rather, they become carriers, but lead normal “clotting” lives. Never one to miss an opportunity, Trinity was tested and revealed the fact she, in-fact, is a type A mild hemophiliac. I feel like I’m starting to sound like a broken record, but you get my point. Obviously there are things she’s only been able to tackle with the advent of modern medical miracles. However, I feel that above those things, my darling daughter, Trinity, is a miracle baby. Like her Mom and Dad, she is a loving and caring person. Talented and smart, she was born to be a leader and survivor! HaPpY BiRtHDaY, Trinity Viola Ripley! I hope you have a fantastic holiday season! Now let’s address something health related and get mucho more than merry wishes out of this post: It’s flu and cold season… Do you know why? Well, I’m no doctor, but it doesn’t take a rocket scientist to figure this one out. Let’s think about a few things. Near the end of November we celebrate Thanksgiving. During this time, we stuff ourselves with food and most of us drink alcohol. This is the beginning of a long and immune system derailing celebration that continues through much of the winter. Honestly, we could go back to October 31st and think about the massive amounts of candy (horrible carbohydrates) that we poison our systems with. Also, during October, the temperature drops significantly. Next, we add the stress of Thanksgiving. Yes, many of us actually build up stress before, during, and after Thanksgiving. Most of this stress is related to getting together with family. Stress has been proven to weaken our immune system, so I included it in my list. While we’re thinking about stress, what about the stress that is associated with buying Christmas presents, Christmas parties, and simply dealing with others during the silly season. Around Christmas (and other holidays) we continue to eat and drink way beyond our normal amounts. So… How do we thank our bodies after Christmas and Thanksgiving? we stay up past midnight eating and drinking for New Year’s Eve! Think about the copious amounts of (bad) food we eat during this period. Think about the cold and often wet weather. Think about the large amounts of stress. Think about all of the alcohol that many of us imbibe. And, think about the stress that’s piled on top of all of this. If you add all of these things together, you can easily see why people get sick during this time of year. I can offer a tiny piece of advice to help. Lessen your food and candy intake. Cut off drinking alcohol after your second drink in any 24 hour period. And, enjoy yourself without stressing over everything. Easy? Not so much… Doable? You betcha! Enjoy yourself, be safe, and love your family and friends! My dad, Julien Kim Ripley, died on December 4th, 2011 at 1:12 a.m. Two years ago, today. Not a single day goes by that I do not think about him. In tribute, I decided to re-post a eulogy that I wrote for him more than a year ago and posted on my HIV Longevity blog. Often when you see a headstone in a graveyard, it has the person’s name and then their birth and death dates separated by a dash. To me, that seems to say that the person’s life merely flashed by—a sprint—and not worthy of talking about. Well, Dad grabbed life by the horns and inspired others around him. His life was not just a dash. Quite the contrary… Dad spent every moment of his life improving himself and others around him. He had a vast thirst for knowledge and continued building it until his dying day. Dad taught me so much about life. He introduced me to music and showed me how to play the guitar and piano. He brought me into his office and helped me learn to use computers before most people even knew what they were. He instilled in me values, a sense of worth, honor, and courage. He took commitment to family and work very seriously. Dad was the hardest working person that I have ever known. He was also frank and insisted upon candid talking. Often he was brutally honest, and not everyone appreciated that, but you always knew that you would hear precisely what he was thinking. Dad was sincere and fair with his words. Rarely would he judge someone else. And, he would encourage me to give everyone the benefit of the doubt. My favorite “Dad story” was also one of his favorites, even though it deeply embarrassed him. We’ve both told and laughed about this one a thousand times, so bear with me if you already know it… I used to work with Dad at his land surveying company, Rodgers and Associates. And, I would often use his desk and computer. One day I was typing away at his desk when he came in and I had to give up the seat. What neither of us knew was that I had spilled a few Milk Duds out of my pocket and into his chair. Well… Dad sat in them and didn’t notice. He sat there for an hour or so working diligently. Finally, a client came in to meet with him and when he stood to greet the man, Dad found he was peeling himself out of his chair. His rosy cheeks and demeanor must have given away the fact that something was wrong, but Dad simply smiled and shook the guest’s hand. Walking down the hall and to the Men’s room with his brown-stained Khaki’s must have been one of the most embarrassing things ever to happen to him. As furious as he was over this incident, Dad told me about it later that afternoon and he laughed at himself instead of scolding me. That was simply the kind of man that he was. As I sat with my Dad and listened to his “death rattle” breathing, I knew that he would not be with us much longer. And, I was right, because he died that night. I’m honestly not sure what made me travel down to my parent’s house that weekend, but I’m glad I did, because I was able to be with him in his last days. Odd as it may sound, I honestly believe that Dad was relieved to see me. Almost as if he succumbed to death with comfort, knowing that I was there. Hard to explain it, but it was a completion of sorts. Dad carried a fire in his heart. A strong fire that could be felt by everyone around him. I miss him every day of my life, but I still feel that fire, inside of me… I think that is because he passed it to me through his lessons and examples. Hopefully I make him proud as I work daily to strengthen and stoke that fire, in the hopes that one day my fire will be as large as his was. Dad was also a humble man. He never tooted his own horn, even though he had plenty of reasons to. He would never have approved of me writing my thoughts and memories for all to read… But, this is a healing process for me, and this is who I am. Fortunately, I know that the man I have become is directly in response to the way he raised and fathered me. So, despite his wishes to stay humble and quiet, I am standing on top of the highest place I know (the Internet) and shouting his praises! I miss my father so much! I will always miss him! And—yes—Dad’s life was much more than just a dash! Posted with love by a son who misses and feels you every day. If you look, you will often find opportunities to bond with your children. The key here is that you must pay attention and be observant. Recently my children have gotten into this rubber band loom bracelet building craze. Normally, I barely notice passing fads like this… However, this time my son made me a beautiful bracelet and meticulously sized it for me. When he handed it over to me you would think he thought he was giving me a million dollars. His eyes were gleaming up at me, and he carefully handed it with two hands with a partial (proud) smile on his face. This stood out to me, and I knew at that moment just how important this “fad” was. 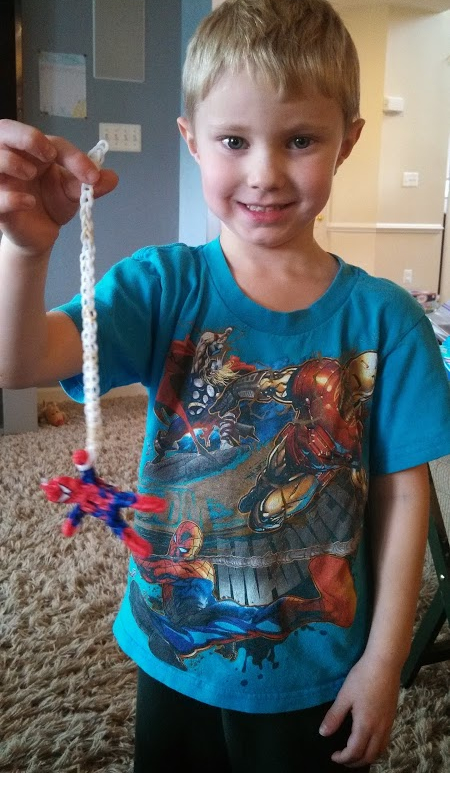 The other day on Pinterest (yes, I go there sometimes) I spotted a Spider-Man rubber band action figure diagram on my friend’s (Nikki) page. It looked cute, and I immediately realized the value… My son is a HUGE superhero fan, and Spider-Man is one of his favorites. I printed out the diagram and left it laying around for him to find. My plan worked… When he saw it, he was absolutely enamored and practically begged to build the character. I offered to work with him and make it the next morning. His eyes brightened, he beamed a smile, and hugged me with a big “Thank you, Daddy.” This melted my heart. My heart was melted even further when he woke me early the next morning and asked if were still going to make Spider-Man. I said, “yes” and he ran off. Coming back with the paper, he said, “I slept with it under my pillow.” Holy crap, my heart was in my throat! I live for (and love) this stuff! After brewing some coffee and making him wait a few minutes, we broke out the loom and started working. It was so fun learning about this fancy-dancy rubber band loom (this was my first time) and how cool it actually was. My son (Xander is five years old) was more than happy to explain how it worked and he diligently hunted for different accessories as we prepared. The whole time we were working, Xander and I chatted and I could see him bouncing off the walls with energy and excitement as the project neared completion. His smile grew by the minute and he kept exclaiming how cool it was. This was an incredibly heartwarming experience for both us! I highly recommend bonding time with your children, and this is a perfect example of something silly and fun that you can do that will remain as a fond memory for years to come. This is what I would consider an intermediate level thing to build and will take some time (it took me about ninety minutes to complete). Rubber bands do break from time-to-time… It is not the end of the world. I used a broken rubber band as another bonding/training tool, explaining to Xander that it’s no big deal. We worked carefully together to replace the broken band and moved on. The video was very well planned and covers everything. But, you need to watch closely at a few key points (at least I did) to really catch on to what he’s doing. Remember that you’re bonding with your child and let them do some of the work. I had Xander searching through his rubber bands to pull out a bunch of the deep red and blue ones. I also asked his advice a few times and had him do some of the actual work. We had a blast! After we finished, Xander made a long string of white rubber bands (sort of like a bracelet that didn’t connect the ends). He held it up grinning and said, Here’s his web. How do you bond with your kids? And, have your kids gotten into the rubber bands? One of my favorite quotes is from James Dean. I love the quote so much that it hangs (with a photo of him) in my den. You can see it and other cool quotes in a previous article (here). This quote holds so much power, and it’s sort of ironic that it came from a man who died at the very young age of twenty-four. A man who lived his life to the fullest and died young. We should all be so lucky! In some ways I feel that I’ve been blessed by having to live with HIV. I know some of you are going, “What? ?” Well, allow me to explain. When I was nineteen, my family doctor told me that I had fewer than two years to live. As a teenager, that put some things into perspective! Immediately I realized all that I had and all that I would lose. Since that day, I have spent every moment realizing it could be my last. For that reason, I honestly think it is cool that I became infected and was faced with this reality. That said, I would certainly much rather not be HIV+ and lead a more “normal” life… However, I consider myself lucky none-the-less. I sincerely mean that… I consider myself lucky! Where am I going with this? You ask. Well let me tell you. You guys have an opportunity here… Use me! I mean it. Live through my eyes for a moment. Simply imagine that you were told by your doctor that you had less than a month to live. Sincerely think this and focus on it for a moment. How would that make you feel? After the momentary freakout, wouldn’t you start to assess your life? Wouldn’t you look at how you could tie up your loose ends? Of course you would! You know what else you would do?? You would spend time with those most important to you. You would honor them with love and shower them with hugs and kisses. You would treat them the way they aught (and deserve) to be treated. You would tell them how important they are to you. You would share with them. You would cry with them. You would live those last few weeks by giving them praise and words of encouragement. As your final days crept up, you would tell them over-and-over again how much you love them. You don’t have to be dying to do any of those things. Rome was not built in a day. Like the Romans, you are creating something that will take incredible amounts of time and effort. You are working on yourself. Making you a smarter, stronger, wiser, healthier, more loving, believing, hard working, patient, and understanding person takes time. You absolutely can improve yourself in a day. You absolutely cannot create your ultimate desired outcome for yourself in a day. As I’ve said in plenty of previous posts, kaizen is a Japanese philosophy that essentially means small, daily improvements. It is a way of life, not a quick fix. If you want to be all that you can be… If you want to maximize your life, than you must plan and follow through over decades! Baby steps is the simple answer to creating the best you. My favorite analogy to improving yourself is, oddly enough, like learning to drive a car with a manual transmission. I’m a stick-shift fan. Assuming you know how to drive a stick… These days, it is basically second nature for you to shift gears. We can easily drink coffee, listen to the radio, think about work, think about family, hold a conversation with the passenger(s), and simply switch from first to second gear without any hesitation or actual thought. However, it was not always so easy. As a matter of fact, if you’re honest with yourself, it was downright tough as nails to drive a stick-shift car when you first started out. Close your eyes for a moment and gradually slip back in time to your very first day in the driver’s seat of a vehicle with a manual transmission. During that very first experience, you were learning and you couldn’t do any of things we listed above. Not only could you not do them, you had to concentrate and focus completely on switching gears and switching gears alone. Nervously, you gripped the wheel and struggled along. When it was time to change from first to second, you adjusted your hands shakily on the steering wheel so that the right hand was off the wheel and had access to the shifter. From there, you eased your foot off the gas while slowly pressing the clutch in with the other foot. Once that tedious part was done, you gripped the shift knob as sweat started to form on your forehead. Pulling the lever with just enough force, you popped the transmission out of first gear and into neutral momentarily. Finally, you kept pressure on the shifter, sliding it carefully into second gear. As if all of that wasn’t enough, now you had to time smoothly pulling the clutch back out while applying gas incrementally. Do you remember that first time? Getting your stick-shift cherry popped?? Wasn’t it kind of like that? Even after that first time, we still had to practice this carefully for hours, days, weeks, or even months before we perfected it enough to feel comfortable. Small gains and improvements were made over time before we could finally switch gears without thinking about it. Over time muscle memory took over and we were finally able to do it without a second thought. These days, you don’t even think about the entire process and can juggle in a bunch of additional tasks. Heck I wrote this blog article while driving a stick-shift, eating an Egg McMuffin, and singing along with the tunes jamming out of my stereo… Ok, I made that part up, and I would never condone blogging while driving… But, you get my point! Improving ourselves is done much in the same way. When we first dabble into an improvement, it often feels foreign and impossible to accomplish. However, with determination and drive you quickly get past that feeling and over time you create a desired result that feels like second nature today. Remember to carefully choose your improvements. Then, draw out goals along the way to achieve your dreams. The last piece of the puzzle is to not only stay focused on your dreams, but to dig deep inside yourself and find the willpower to follow through! Nothing is impossible to a person who believes in their dreams and believes in themselves. Dream it! Write it! Plan it! Do it! Forget cards, flowers, and chocolates… Well, don’t forget them, but don’t rely only on them. What she really wants is sincerity and love! Love offered freely and without strings attached. I’m talking about love given regardless of what you get in return. I’ll let you in on a little secret: You must give unconditional love to get it. That may not sound like much to you, but it’s precisely what I’m talking about. It was sincere and said honestly with love. I meant it. And, she knew I meant it. Therefore, it has stuck with her all of these years. To this day she still reminds me of how special that conversation made her feel. I’m not telling you to skip the flowers, but I am suggesting that there are others things you can give, do, and say that will be much more memorable. One of the most important things that I’ve discovered is listening. I mean real listening… Not sitting there while she’s talking. I’m talking about, turn the TV off, set your phone down, step away from the laptop kind of listening. Look her in the eyes and nod at appropriate times. Then, when she’s done talking, compute what she said and reply with an honest assessment and appreciation with what you heard. This ain’t rocket science, folks. Many would have you believe that relationships are incredibly tough and nearly impossible to build and keep strong. The truth is, they are much simpler than we pretend. Level with your soul mate, treat her with honor and dignity, and listen to her. This is the valuable key to staying in a healthy relationship. There are people out there that will tell you that a man is weak for doting on his wife. This is ridiculous and any man who deserves a good woman in his life knows that it’s untrue. The truth is that it is our responsibility to love and care for our wives and our families. A real man can be strong and compassionate at the same time. Tell me what you do to shower your spouse with love. Tell me what you’ve tried… What works, and what doesn’t? I hope this article was beneficial. More than nineteen years ago I was married to my soul mate, Kristine Marie Gubas. We actually started dating about twenty-six years ago. She was born on July 31, 1971 and the world has been a better place since that moment. That’s right, this post comes from my heart. Obviously this is more than fitness. A healthy body comes from multiple angles. Not the least of which is relationships. Having a love interest in your life has been proven to strengthen your immune system. On top of that, a spouse offers a live-in training partner. Did you know that married men and women live longer than single folks? Even more mind blowing is the fact that single men are twice as likely to die in middle age than married ones! Again I fall back on the fact that when I say “wealthy” I am not only talking about money. That said, there’s more money to be found in a marriage. Think about it… Obvious benefits come if you’re both working and only have one house payment. The other side of wealth is simply abundance of something good in life. Well, Kristine fills me with immeasurable amounts of wealth in all of these areas. What’s not to be inspired by? I’m an HIV+ hemophiliac that was supposed to have died ~25 years ago (according to my family doctor). Instead, I’m thriving and surviving as a successful businessman, writer, dad, and adrenaline enthusiast! I sincerely feel that ALL of my successes are owed in some form or fashion to Kristine for her loving support and knowledge. See! There you have it! I was able to wish my lover a happy birthday and you guys all got healthy and wealthy and inspirational sagely advice to boot! I love you with all my heart. My love is stronger and greater than it's ever been before. With each day, my love grows immensely and I can foresee it continuing to grow throughout our lives. Having you there as a supportive wife, best friend, and soul mate has been and always will be incredible. You are my soul mate. And, I am the most fortunate man in the world in many ways. Without you, my dreams would be stagnant and boring.